The thing is that we all have lapses in confidence as we go a long. The way I visualise it is that confidence is like a big jug of water. Sometimes it feels like it’s over flowing, sometimes it’s nearly empty and sometimes it’s somewhere in between – but no matter where it is you can always fill it up – it doesn’t have to be gone forever. Just knowing this really does help, because when we feel like our confidence has gone our gut reaction is to mourn this loss and worry about how we’ll be able to manage without it. But here’s the thing. You really don’t have to. There are ways to give your confidence a much boost. Decide what area of your life you’d like more confidence in. Your gut reaction here might be to say – all of it. But if you really drill it down there’s bound to be one area that you’d choose over the others. Choosing one to focus on will really help you to stop feeling overwhelmed as you try to tackle everything all at once. Once you’ve chosen try and be specific. Why do you feel you need more confidence? Is there something that’s currently going wrong or is it a feeling you’re getting? Decide what does success look like for you and scribble this down. By making this process an experiment it really does take the pressure off as all of a sudden there is no failure only learning. Keep a log of what you do and the results that you get, remembering to keep tweaking as you go (just as you would if it was a scientific experiment) rather than giving up if something didn’t turn out as you’d hoped. Everyone is different, and for you the fear or lack of confidence may not disappear immediately or over night, and it might take a bit of time, but this shouldn’t be a reason to give up. Your fear is just a feeling that’s all, and it may help to make friends with it and explain that you realise it’s there for a reason but you have to plough on anyway. Simply visualising your fear may help in itself and don’t forget to take some good deep breaths as you go. Start small and pick something that you’re going to do slightly differently or that you’re going to do more of and look for opportunities to do just that. For example – you may want more confidence when speaking to groups so look for opportunities to speak in front of people. 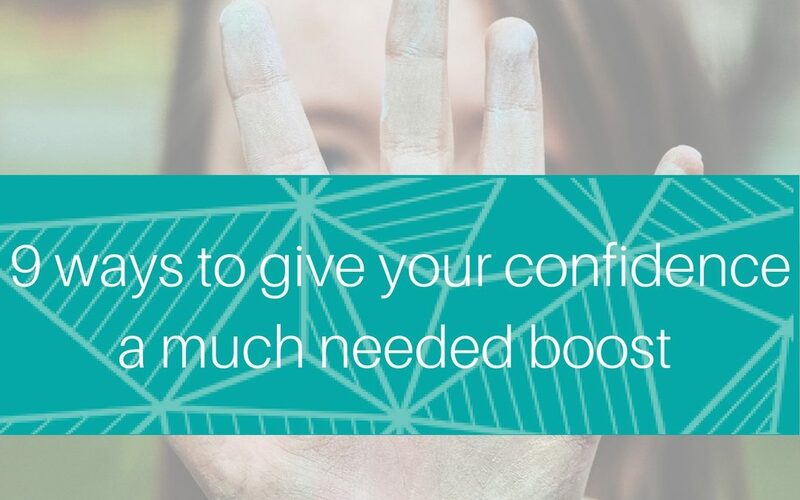 Yes you might think that you need to boost your confidence in all aspects of your life, but chances are that there’s one part where you’re rocking it. It doesn’t matter where this is – you might be really confident in a hobby, with your family, or even feel amazingly confident when you’re out doing something you love. Whatever it is write down how this feels and lock it in. This is the feeling that you’re aiming for (and you need to remember) when you’re working on building your confidence somewhere else. Sometimes we might not think we come across as confident, but other people aren’t picking up on a that at all. So, get some feedback. Ask your friends, peers, and team how you come across in specific situations and see what they say. You may be pleasantly surprised. We all need a bit of reassurance from time to time. If you’re doing something outside of your comfort zone ask people for feedback after the event and ask them to tell you what you did well. I know it might seem self indulgent but here’s the thing – if you know what you did well, you can do more of that – plus it feels great to get some praise which really will help your confidence levels. Rather than picturing what you think is going to go wrong, or what you’ve done badly in the past stay focused on how amazing the end result is going to be. This will trick your brain into thinking you’re a lot more confident before you start. We all have lapses in confidence from time to time so go easy and forgive yourself. This doesn’t mean that you ‘don’t have confidence’ so don’t describe yourself in this way. Instead describe yourself as someone who is confident and more than capable to do something because you really can. It’s so easy to give up on something because it was tough or you really felt the fear. But keep at it – because every small step is a step in the right direction. I’d love to hear your thoughts – let me know by leaving a comment.